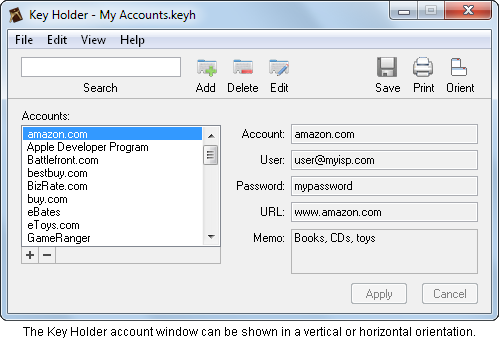 Key Holder is a password manager application. For each password account, the account name, user, password, Internet URL, and a memo field for miscellaneous notes can be kept. 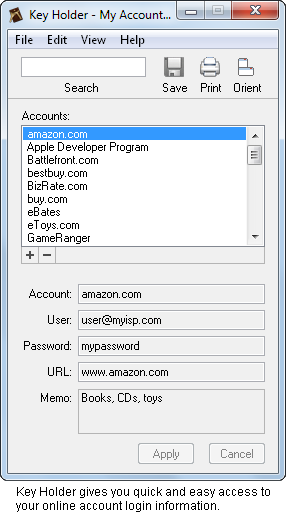 A menu command allows you to go directly to the account URL by automatically launching your web browser, e-mail, or other Internet application. Key Holder supports multiple account files. Account files are encrypted and can be individually password protected, allowing one or more users to maintain private and secure account lists. A search field is available to filter the account list, and account files can be printed. Key Holder can also be used to keep lists of other secure information. For example, you could keep a list of software registration codes by entering the registered name for the software into the User field and the registration code into the Password field. The Key Holder account window is compact and can be shown in a vertical or horizontal orientation, allowing it to be kept open for convenience and easily tucked out of the way. Key Holder requires an IBM PC or compatible using Windows XP or later. To view the application documentation, choose the Key Holder Help command in the Help menu. Help topics include "About Key Holder", as well as topics containing detailed information about the application windows and functions. Contextual help is also available for window items by right-clicking the item, or by pressing the F1 key when the item has the focus. The unregistered version of Key Holder will operate for 30 days, and will show the Register dialog each time you start the application. Once you have determined that Key Holder is operating to your satisfaction, you can register for $9.95 through the online Kagi Store by clicking Register in the Register dialog. Kagi accepts credit cards, PayPal, cash, or checks. IMPORTANT: Please include the Owner Name shown in the Register dialog with your order. This information is used to generate your registration code. If it is incorrect, your code will not work. After you register, you will receive a registration code by e-mail. To avoid delivery problems with your registration code, ensure that your e-mail system will accept mail from support@sspi-software.com. To enter your code, click Enter Code in the Register dialog. Registered users of prior releases of Key Holder can upgrade to Release 2 for an upgrade charge of $5. A product announcement containing upgrade ordering instructions was sent to all registered users by e-mail. Please contact support@sspi-software.com if you need to receive another copy of the ordering instructions. Key Holder is distributed on an 'as is' basis without warranty of any kind either express or implied, including, but not limited to, implied warranties of merchantability and fitness for a particular purpose. Account window now has an optional tool bar. Replaced the find command with a tool bar search field that filters the account list. Memo field size has been increased to 3 lines and now includes a scroll bar as necessary. Memo field will expand with window size when the window is in horizontal orientation. New online help system for Windows 7 and Vista compatibility. Thanks to Tony Fletcher of Tony Fletcher Design LLC (www.tonyfletcher.com) for the application icon. Additional icon work by Alex Forlini. Key Holder is made with Real Studio. Real Studio is a trademark of Real Software, Inc.